What I liked was that the only parts that could reasonably be read were, ‘Welcome’ and ‘Thank you.’ The rest I had to decipher with the help of Photoshop when I got home. 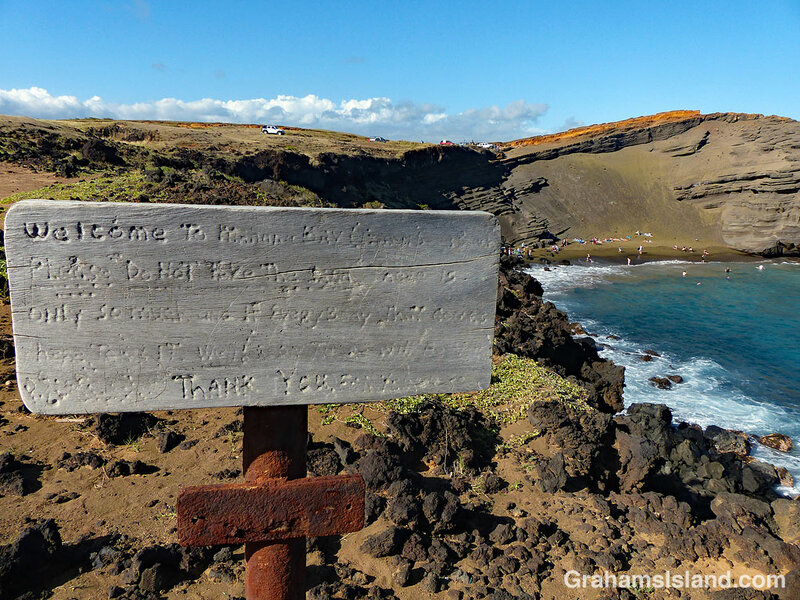 Thanks for posting the pic, Graham, we never quite made it to see the green sand. Has this area been affected by the lava flow? Not by the flow. It’s too far away. But that area of the island is downwind of most of the vog and ash falls so I think it’s been a bit bleak there for a while. I’d like to do another hike in that area, but that will have to wait for an improvement in conditions. That makes sense! I looked at a map after I asked you the question. We had visited the Ka’u Coffee Plantation in Pahala and wondered if they were OK. I just ordered some of their coffee online!